I have a Schneider PL7-pro application with password protected DFBs, dose anyone have a way to open the protected DFBs. Send to me PL7-pro application with password protected DFBs, I will send back without the password. Russian wrote: Открыть проект *.stx WinRar и разархивировать. Открыть *. *\EXE\APP\STATION.APX в Hex редакторе. 1. Если закрыт весь проект, то OffSet 114 будут значения отличные от 00. 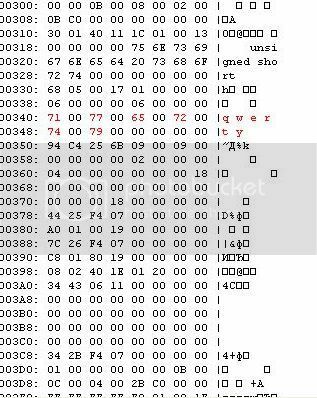 In the Hex Editor to change values at 00 and save separately STATION.APX. Open in WinRar-e *. 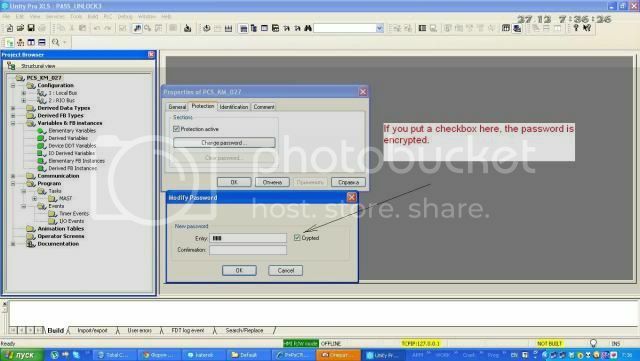 * \ EXE \ APP \ mouse and drag it STATION.APX, which kept separately. Close WinRar. The project will be opened. Пароль есть. В Hex редакторе поменять значения на 00 и сохранить отдельно STATION.APX. 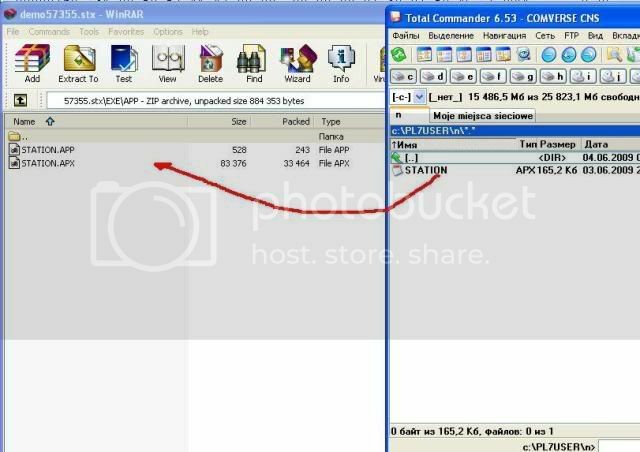 Открыть в WinRar –е *. *\EXE\APP\ и мышкой перетащить туда STATION.APX, которую сохранили отдельно. Закрыть WinRar. Проект будет открыт. Open STATION.APX in Hex Editor. Type Ctrl + F and type the name of a closed block of DFB, Enter. Search the following format: 00 00 00 0H 00 <password> 00 .. 00 <title block DFB>. Open *. stx in PL7pro and enter the password to open the unit. Открыть STATION.APX в Hex редакторе. Набрать Ctrl+F и набрать название закрытого блока DFB, Enter. Формат искать следующий: 00 00 00 0Х 00 <пароль> 00 .. 00 <название блока DFB>. Открыть *.stx в PL7pro и ввести пароль, открыть блок. 1.Open Unity Pro project *.stu and unpack by WinRar. Open *. *\BinAppli\PreviousStation.apx or Station.apx by HexEditor. If project is passworded then OffSet 2218 -password. I can´t open or copy the file PathBase.db because is a temporal file and is being used by another process (Unity Pro). How could I open it? juanjobeat wrote: I can´t open or copy the file PathBase.db because is a temporal file and is being used by another process (Unity Pro). Open stu with WinRAR as an archive, not with Unity. I've opened PathBase.db file with HexEditor but I didn´t find the word "Creation" nor "Author" in the whole document. Send me the project (link on rapidshare). Try to help. I the same do not see in PathBase.db file with HexEditor but I didn´t find the word "Creation" nor "Author" in the whole document. vlad2006gr wrote: Password is possible: adminpsw. Just curious, how did you find it out? If the developer did not sign the DFB block of text that Author and Creation date will not be. Or, if you erase a comment block that information. You can look at inputs and outputs of the block, as well as its name. I could not open the project because they do not know the version of Unity. 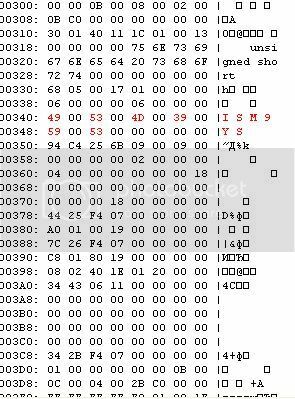 But the DFB blocks have standard input names such as ХХХХ.EBOOL, XXXX.BOOL, XXXX.INT. And most importantly, the password is between the letters a and b . Format is clearly visible in the picture above post. And that is why there is not visible block name a mystery to me. И самое главное, сам пароль находится между букв a и b. Формат хорошо виден на изображении постом выше. А вот почему там невидно названия блока для меня загадка. I've opened my PathBase.db file and I've found "adminpsw" several times, just after the names of protected DFB's. What I didn't find is the word "Author" or "Creation date". That was my problem. vlad2006gr wrote: И самое главное, сам пароль находится между букв a и b. Many thanks for the tip !!!!! Everything turned out. More to such people - "non-greedy up to someone else's good. " All the very, very and good luck! Russian wrote: Огромное спасибо за подсказку!!!!! Все получилось. Побольше бы таких людей - "нежадных до чужого добра". vlad2006gr wrote: 1.Open Unity Pro project *.stu and unpack by WinRar. Sorry, but it doesn't work. I use Unity Pro XL 5.0, I try to change values at 00 in OffSet 2218 but my project still lock. If password of project doesn't crypted ("crypted box" unchecked in project properties) I can see pass in OffSet 4B0, but if it is crypted in OffSet 4B0 I see crypted text. How to unlock this project?? Thank you for help! Download project on rapidshare.com and give me link in PM. I'll try to help. Please can u try to find the password so i can unprotect these DFBs? To open the password in the latest versions of unity, we need the whole project! What is written above, but for earlier versions of Unity. Link to the project can be given through private message. But I only success with Unity Pro Xl which is locked without "Crypted"
- Insert 12345678 : after encryted 128 bits , It will be "EBEFC1EF"
- So if I know encrypted password is "713DFEBS" How do I know real password ? I've a project file that the sections is being locked. is there anyway to unlock or retrieve the password? I've tried reading the guides given but to no avail. Please kindly advise or help. thanks vlad2006gr for the help. can I ask if the offset 2218 or 114 is being checked to seek out the password? I'm asking because the program at site is been locked and I wish to have the password to do cross checking. Versions for unity 4.1 and more can be password encrypted. Password in your program (unity 4.1 and more) so you do not define. Password is located in different places. At offset not identify. Your password is encrypted. In this case: you can only remove. It is very difficult. But when connecting to PLCs in Unity, the program will different from the PLC. But you will be able to watch all the signals. If the password is not encrypted, it is offset 340 explicitly. When a password is set for the second time, he shifted. Replace known password does not work, you need to recalculate the checksums. Rus: Если пароль зашифрован, то его нельзя определить. По крайней мере у меня не получилось. Подставить зашифрованный, но известный пароль не получилось, Unity проверяет контрольную сумму программы и выдает ошибку, после чего вылетает. Еще один нюанс, если в программе был установлен пароль, потом снят и поставлен другой, или при портировании в другую версию, положение пароля в программе меняется. Т.е. если вы написали программу и поставили пароль, то его положение легко найти. Если программа из другой версии, или несколько раз ставили пароль (снимали, делали изменения в программе и потом опять поставили), то его положение смещается. I have a problem with a Schneider project made with unity 6...it's protect. Can you hel me ??? Can i Ask you in how many file was the password? I check deeply *.stu and *.sta file and i find a lot of diff from a protected file and the same without protection. In Unity, when you open the file and close it always file is modified. Password in your file is encoded and not explicitly. By comparison, it does not compute. I have importance program that encrypted by old staff. And password was not transfered to me. So could you please help me to clear this password? Here is link to download this program. ttl3ihut, please change the project file format. ZEF or. XEF. I have another version of Unity pro. Here is link to download file. I exported it to .XEF file, please have a look. ttl3ihut, take away project. No password. Thank you so much, i already open it without password! I try to clear it several months without result! Can you help me and inform me about project's password or remove it? Я получил в обслуживание объект в котором есть несколько PLC c проектами написанными на Unity Pro. Не смогли бы вы помочь мне и подсказать или снять пароль хотя бы с одного проекта? Last edited by Serz on Tue Jul 08, 2014 11:13 am, edited 1 time in total. Дело в том, что у нас разные версии Unity. На будущее делайте экспорт проекта в *.ZEF . Иначе, из-за разных библиотек железа в программах , я не смогу дать полноценный файл при зашифрованном пароле. Из STA и ZTX не все можно восстановить. Но сам файл STU тоже нужен. Спасибо Вам огромное, сегодня добрался до объекта с компом, всё работает. Сейчас как нормальный человек могу обслуживать этот участок и понимать, что за проблемы случаются с оборудованием. У меня версия Unity Pro v5.0, в менюшке нигде не нашёл возможности создания архива с расширением ZEF. Возможно ZEF это для новых версий Unity Pro. Заранее огромное человеческое спасибо Вам! В архиве *.stu от 7 версии, используйте архивный формат *.sta для конвертации в 5 версию. После конверсии нужно проверить DTM конфигурацию проекта, т.к. библиотеки DTM не портируются в *.sta формате. Библиотеки по CAN OPEN для альтиваров. Могут быть проблемы с обменном по сети с частотниками. Да, *.ZEF формат начался только с 6 версии. Ещё раз большое Вам спасибо за помощь и консультацию! I have a problem with a unity project with all the program in sections blocked and i really need help to unblock this itens in sections. Here is the link with the project. pasword plc model: TWDLCAA24DRF, thank you so much for your time and consideration. Last edited by letranlong on Mon Feb 01, 2016 1:12 pm, edited 3 times in total. letranlong , project on the memory card? Tried to intercept the exchange with the controller? vlad2006gr wrote: letranlong , project on the memory card? Tried to intercept the exchange with the controller? I have not project on the memory card. and also do not programs plc original. so I can't upload and download or exchange with the controller. how to do exchange with the controller upload and download with controlled ? how doing upload and download with controlled ? vlad2006gr, i believe the file is not on the dropbox anymore, can you resend it to me? Everytime i clicl on the file it shows the follow message: The resource could not be found. Have you already used the unitelway driver to download with the correct cable and it´s not working? You don´t have the application file correct? Hey vlad2006gr i couldn´t download the file, would you mind send it again to me? Last edited by vlad2006gr on Fri Nov 14, 2014 5:26 am, edited 1 time in total.